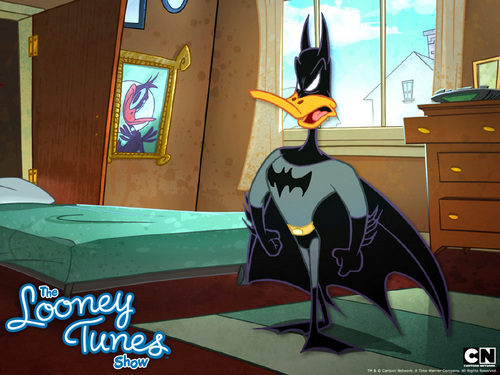 batman daffy. . HD Wallpaper and background images in the Looney Tunes club tagged: looney looney tunes wallpaper tunes. This Looney Tunes wallpaper contains teken, poster, tekst, bord, and schoolbord. There might also be woonkamer, zitkamer, voorkamer, salon, massagesalon, salon, lessenaar, leestafel, katheder, and lezing desk. waow! thiz iz cool! this is the ep "Reunion"